Students walk around the room and ask each other "How do you say ~ in English/Spanish/Chinese/German. Based on Sunshine 1 lesson 9. Pass out the worksheet, and give each student a number of cards. The more cards each student has, the easier the activity becomes. 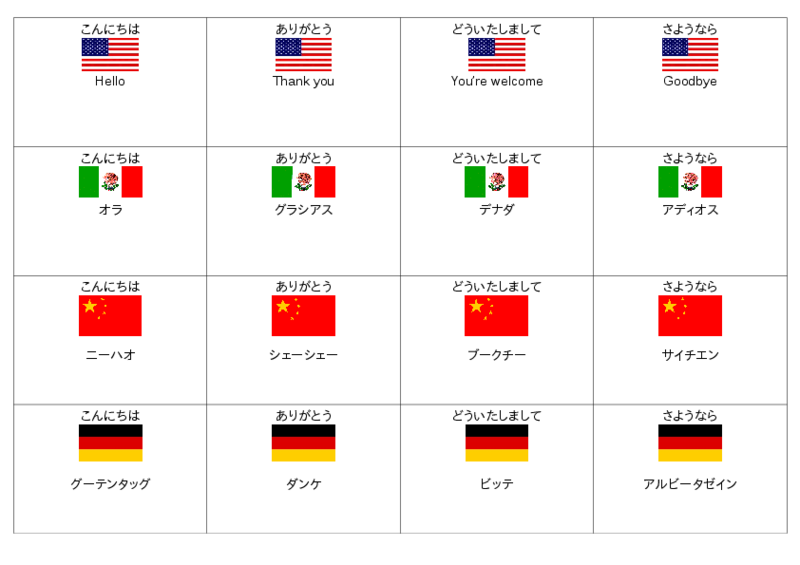 A: Do you know any (English/Spanish/Chinese/German) ? B: Yes, I do. / No, I don't. A: How do you say (こんにちは/ありがとう/どういたしまして/さようなら) in English(previous language)? B: You say “hello” . / I don't know. 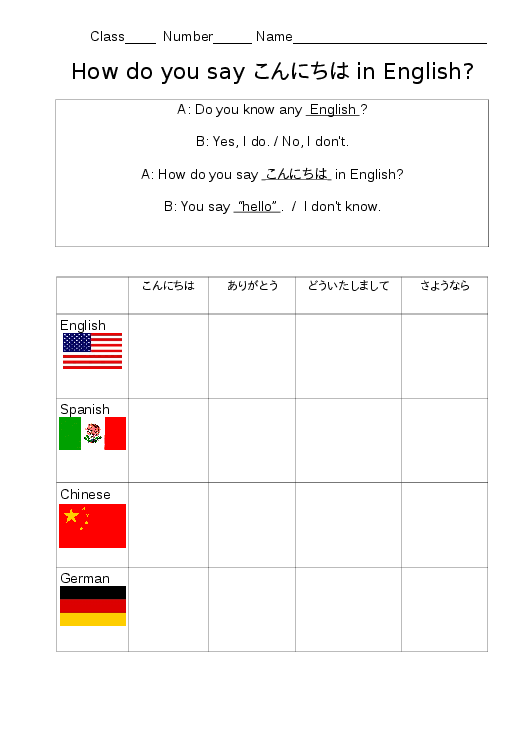 The first two lines of the dialog are optional, but they make the activity easier, provided that it's not too much for the students to remember. When a student learns how to say a word, he writes that word in the corresponding cell on the worksheet. When a student is asked "How do you say (word) in (language)?" he answers based on the cards he has, and the answers he has already collected on his worksheet. The student who gets a bingo/gets the most answers wins. The danger with this activity is that students will look at each other's papers or cards, and simply copy the answers without doing the dialog. By giving the students a way of knowing which questions to ask the other students, you should be able to lower the difficulty enough that the students aren't tempted to cheat.